Hamstring soccer injury occurs very frequently in soccer players, due to lots of sprinting and sudden change of direction and speed. Soccer is a sport where hamstring muscles are simply overused to the point of tearing. Hamstring muscles are used to control bending the leg at the knee, so when injured, player is immobilized due to the whole leg feeling loose and painful. 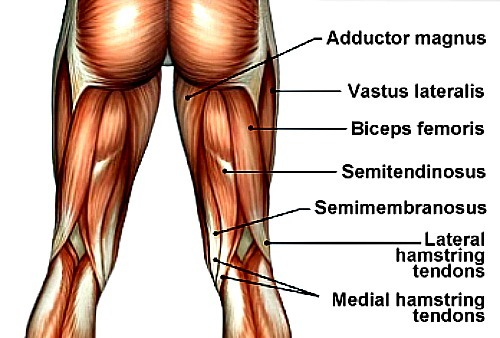 Three main hamstring muscle groups connect the back of the leg from the pelvis, to the bones in the lower leg. They are called Biceps Femoris, Semitendinosus and Semimembranosus. An injury to any of these three muscles can range from minor strains and pulls to a total tear of the muscle. Hamstring injury will cause a sudden sharp pain in the back of the thigh. This pain is so intense that the player will usually stop at mid-stride. Most commonly, hamstring injury occurs when running or kicking the soccer ball. Just like any injury, severity of the hamstring soccer injury will range from Grade I to Grade III. Grade I hamstring injury is a mild muscle strain that happens by over stretching one of the hamstring muscles, causing minimal damage. Grade I hamstring injury has no significant tear in the muscle, but is rather over stretched to the point where some muscle fibers have started to tear. Muscle stiffness, soreness and tightness in the back of the thigh. A normal walking gait and range of motion with some discomfort. Flexing the knee to bring the heel up. Grade II hamstring injury usually involves partial tear to one or more of the hamstring muscle groups. Gait will be affected and limp may be showing. Muscle pain, sharp twinges and tightness in the back of the thigh. Pressure on the muscle increases pain. Limited range of motion and pain when flexing the knee. Grade III hamstring injuries will have a severe or complete tear to one or more hamstring muscle groups. Symptoms for a Grade III hamstring injuries are very noticeable because of the pain, and immediate loss of motion in the leg. Severe pain - particularly during knee flexing. Noticeable swelling and bruising visible immediately after injury. Pain noticeable during rest, becoming severe with movement. Soccer, and other sports that require running at different speeds and changing direction, is very physically demanding for the hamstring muscles that constantly contract and bend as the player moves. Hamstring muscles work extremely hard to decelerate the tibia (shin bone) as it swings out to take a stride. It is in this phase, just before the foot strikes the ground, that the hamstring muscles become injured. In this position, all hamstring muscle groups are activated and approaching their maximum length. Doing too much, too soon or pushing beyond the body limits. Muscle imbalance between the quadriceps and hamstring muscle groups. Muscle fatigue that leads to over-exertion. Leg Length Differences. A shorter leg may have tighter hamstrings which are more likely to pull. Improper or No Warm-Up is a major factor in hamstring soccer injuries. It can also be easily prevented with the right positive habit. For more information on hamstring muscle injuries visit Sports Injury Clinic - Hamstring Injury.